Editor's note: This is number 31 in a series of posts by Dennis Horne, sharing quotes from his book, Determining Doctrine: A Reference Guide for Evaluating Doctrinal Truth. You can read the introductory post here. The first part of each post is a new introduction, placing the quotes in context with contemporary issues. The quotes that then follow are from the Determining Doctrine book, which contains many quotes that are not readily available elsewhere or are exclusive to the book. Scripture—the word of God—has been, is now, and always will be the main source of Mormon doctrine and practice. Its importance cannot be overstated. In combination with faith and the gift of the Holy Ghost it becomes the single most powerful defense that exists against the Adversary, along with his spirit and mortal followers and their temptations and deceptions. For men shall be lovers of their own selves—Check! despisers of those that are good—Check! lovers of pleasures more than lovers of God—Check! Check! Question: When will we receive more of the mind and will of the Lord, and when will the great doctrinal restoration be completed? We have a revealed answer as to when we shall receive the sealed portion of the Book of Mormon. What we have so far received is to test our faith. When we repent of all our iniquity and become clean before the Lord, and when we exercise faith in him like unto the brother of Jared, then the sealed portion of the ancient word will be translated and read from the housetops. The same is certainly true of the brass plates and the lost portions of the Bible. What we have received so far is to test our faith. Why should the Lord give us more of the biblical word if we are indifferent to what he has already revealed? Does anyone think the Lord should give us the words of Zenos when we are ignoring the words of Isaiah? There are revelations without end that are available to the faithful at any time they are prepared to receive them. Until more is revealed, we have our present canon, which has been enlarged on a number of occasions since the Prophet Joseph Smith’s day. In the 1970s Elder McConkie attempted to enlarge it further by recommending to the First Presidency and Quorum of the Twelve that some items that he believed to be revelatory truth be considered for canonization. 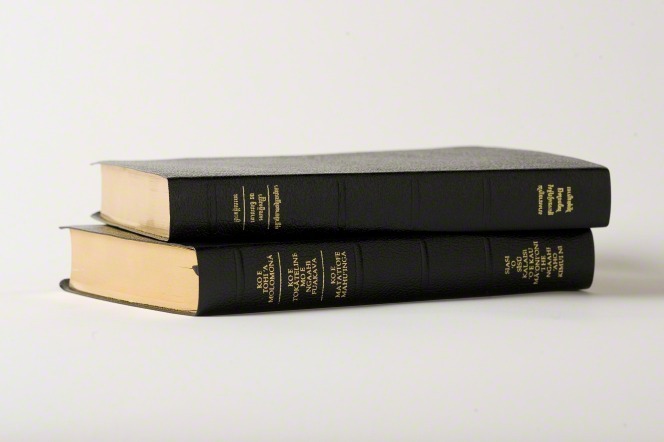 These were items like portions of the Lectures on Faith, the Wentworth letter (including two new Articles of Faith), many passages from the Joseph Smith Translation, the vision of the redemption of the dead given to President Joseph F. Smith, and Joseph Smith’s vision of the Celestial Kingdom. Only two of his recommendations were approved, and as tremendously valuable as the other materials are, they yet remain outside of the official Mormon canon. The Greek word kanon means, first of all, a "ruler" or a "straightedge" and, secondarily, a "standard" or "norm." From this second meaning comes the English word canon, which means, when referring to the scriptures, "the list of books recognized as authoritative." The canon of scripture, then, is the standard collection of texts accepted by Christians as the word of God, or as authoritative. If a book is said to be canonical or one of the "standard works" (the LDS equivalent of "canonical"), that means it is on the list of approved and accepted scriptural books. For non-Mormons the canon is the list of books that make up the Bible. Permit me to make a few observations about the Latter-day Saint concept of canon. As you all know, the word canon is of Latin and Greek origin. Though it has numerous meanings, for our purposes it denotes “a collection or authoritative list of books accepted as holy scripture.” I leave to others the task of defining—insofar as the Bible is concerned—the content of that list of books, but note in passing that the traditional Christian world has had a long and hard struggle throughout its history to define which writings are sacred, inspired, and binding on believers. Protestant Bibles (including the King James Version), which Latter-day Saints accept as “the word of God as far as it is translated correctly” (A of F 8), do not include some books accepted as canonical by the Roman Catholic and Orthodox churches. Even within Protestantism, the question of canon is perhaps not yet unanimously resolved…. Latter-day Saint views on canon, in the minds of some Christians are so extreme as to deny us the right to even refer to ourselves as Christians. We are simply unacceptable to some of our Christian brethren, gone beyond heresy to anathema. While that may be regrettable, what others label us, or even think about us, is of far lesser importance than what is true and thus acceptable to God. Basic to the Latter-day Saint concept of canon are two eternal principles. The first is that compared to the rest of the Christian world, ours is an expanded canon. In addition to the Bible, we accept as canonical three other books of holy scripture…. The importance of spoken or noncanonized written scripture cannot be overemphasized, because it is the source of all canonized scripture. The usual pattern for the development of canonized scripture is that it is first given by the Lord to his living prophet, who teaches it to the people; then the prophet either writes the teachings himself or has another write for him so the people can refer back to the exact words. The written words are then presented to the members of the Church, usually in a general conference, for their vote as to whether or not they are willing to accept the statement as part of the official scripture. Once the scripture is voted upon and accepted, it is said to be canonized and becomes part of the official written scripture or standard works. Why do some feel comfortable accepting the parts of the JST that are in the canon of scripture (the standard works), such as the book of Moses and Joseph Smith—Matthew, but feel less inclined to accept the other JST alterations? There is no question but that we are firmly committed to the canon, the standard works, and that these books of scripture serve as the rule of faith and practice for the Latter-day Saints; they are binding upon us. At the same time, if any people in all the wide world should have reason to be nervous about sealing the canon, it is the Latter-day Saints. For us nothing is more fixed, set, and established than the eternal fact that the canon of scripture is open, flexible, and expanding. What is scripture one day may become part of the canon the next, as was the case in 1976 with the Vision of the Celestial Kingdom (D&C 137) and the Vision of the Redemption of the Dead (D&C 138). These were, according to the definition provided in modern revelation (D&C 68:3-4), scripture from the time they were given; they were just as true before they were canonized in 1976. The same is so in regard to the entire JST before it was printed by the Reorganized Church. Further, in our study or our inquiry after the mind and will of the Lord, we as a people are not bound by a single collection of sacred books. We are called upon to "live by every word . . . of God" (D&C 84:44), to open ourselves to new truths as they may come forth through proper channels. The addresses delivered by the President of the Church at general conference are not in the canon, nor are such official doctrinal declarations of the First Presidency as "The Origin of Man" (1909) or "The Father and the Son" (1916) or the Proclamation on the Family (1995), but they certainly represent the mind and will and voice of the Lord to the Saints; the members of the Church are expected to "give diligent heed to the words of eternal life" (D&C 84:43) as they come from the lips of the Lord's anointed servants. Does anyone really believe that what is said in scripture by Alma or Paul or John the Beloved is any more binding on the Saints in our day than President Ezra Taft Benson's messages on the Book of Mormon or President Howard W. Hunter's pleas for greater Christian charity and more devoted service in the temples?